Over the last year-and-a-half, Metro has been working with community members and numerous stakeholders on restructuring the agency’s vast bus system. This is an effort we’re calling the NextGen Bus Study. The aim is simple. 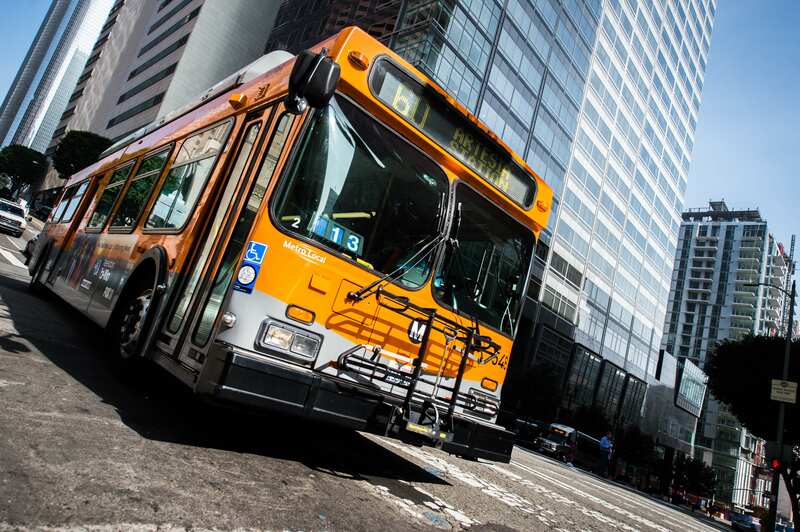 Metro wants to create a faster bus system that better serves L.A. County. 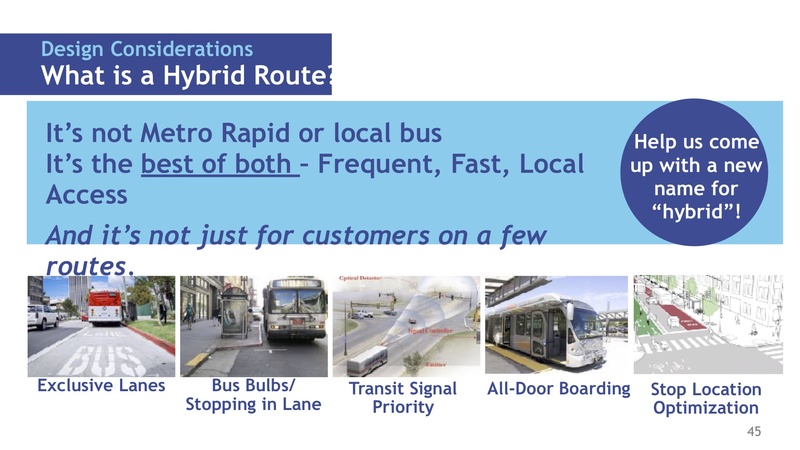 This post will look first at some background on NextGen and then below at some service concepts Metro is considering — including ‘hybrid’ bus routes. First, some background. Buses carry about 70 percent of Metro’s boardings but, like many transit agencies around the U.S., Metro bus ridership has declined significantly. Metro has gone from almost 371 million annual bus boardings in 2009 to 275.7 million in 2018. Why? 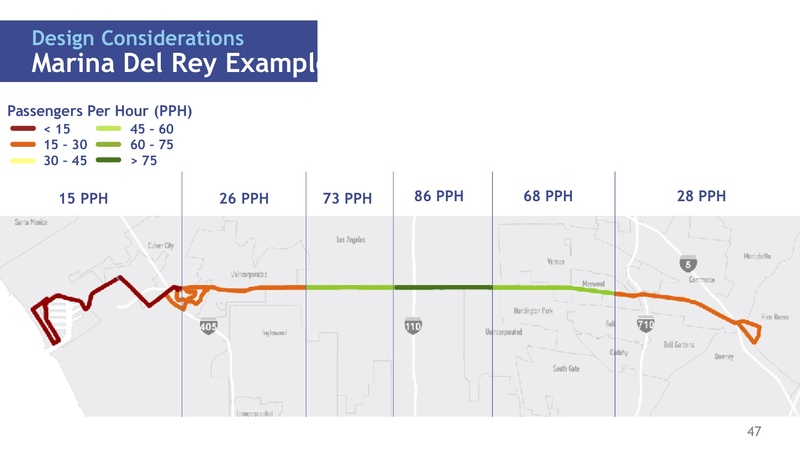 Among many reasons, traffic has impacted bus speeds and ridership patterns are different due to changes in how, when and where people work and travel. Metro typically adjusts routes and schedules twice a year but the bus system hasn’t been fundamentally restructured in more than 25 years. Metro thinks — and apparently so do riders and ex-riders — that the time is very ripe for an overhaul. •Metro’s advertising and marketing efforts about NextGen have had more than 10 million “touchpoints” — i.e. the number of people potentially exposed to our messages about NextGen. •Over the past year Metro has hosted and participated in more than 200 events, meetings and presentations. •Metro has received feedback from more than 12,000 people through surveys conducted on the bus, online, at events and in person. This culminated in Metro hosting 18 public workshops in the past three months attended by more than 950 people, resulting in 1,500-plus comments. •Metro has created a NextGen Working Group that includes 50-plus representatives from Metro Service Councils, community-based groups, faith communities, business associations, educational institutions, advocacy groups and environmental organizations. They have met with us five times over the past year and have provided important insight and feedback about reliability, safety, security, connectivity and accessibility of our bus system. They have also helped us spread awareness of the NextGen Bus Study. So where is NextGen now? 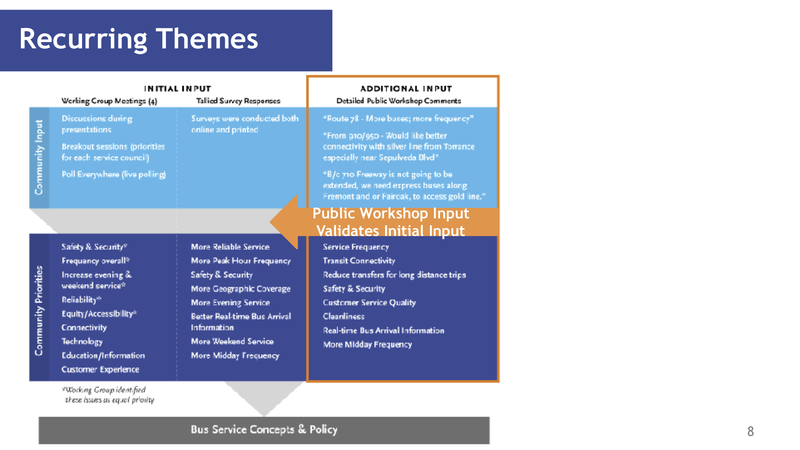 Metro staff are developing ‘Service Concepts’ — a set of policy choices and guidelines that define how the bus system should be redesigned and what kind of service should be provided in various communities. Metro staff plan to bring these concepts to the Metro Board this spring for their consideration. Once approved, the next step will be to redesign our bus routes and then hold public hearings. •One concept Metro is looking at is a hybrid of local and rapid bus service that would use bus lanes, bus bulbs (i.e. the sidewalk comes out to the street so buses don’t have to pull over), traffic signal priority, all-door boarding and improved bus stop spacing to speed up bus service in key corridors. With the cooperation of cities who manage streets and signals, these improvements could allow us to merge local and rapid bus service in a way that could lead to better overall service on key corridors. •Stop spacing is always a difficult issue for transit agencies as no one wants to lose their stop. At the same time, too many stops too close together slow overall service. 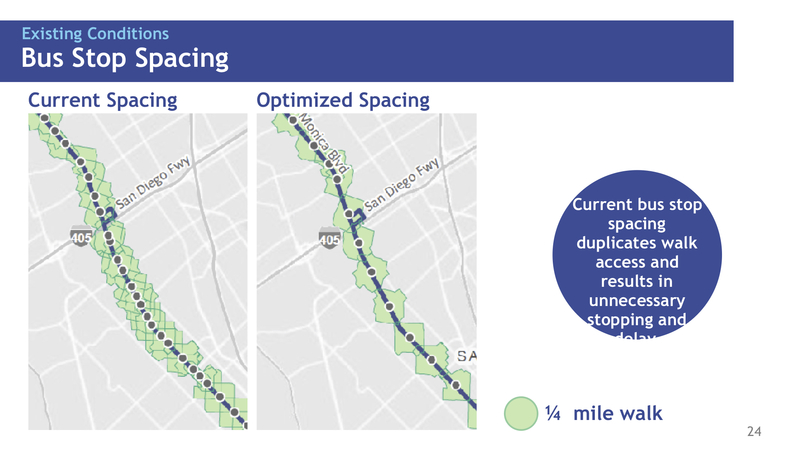 That said, Metro thinks it can optimize spacing and speed up service without resulting in longer walks for many people — although it may mean using a different stop. •Metro’s goal is to largely redeploy existing services to create a better bus system. In some cases, that means improving bus service in key corridors where there is already demand and finding better ways to serve areas where bus ridership is extremely low. Example: look at ridership along the Metro 108 bus that runs between Pico Rivera and Marina del Rey. Ridership is very concentrated in the middle, where the market demand is. What if, in some cases, Metro concentrated its resources to serve routes with the highest demand and found other ways to better serve places like Marina del Rey — where ridership is a very low at 15 people per hour? Although there are many vehicle trips made around Marina del Rey, we’ve found that very few people want to travel east onto Slauson, where Line 108 operates. Rather, people want to go north and south. With better coordination with other local bus agencies and perhaps new mobility-on-demand services that Metro and municipal bus agencies are developing, Metro believes this could improve transit and ridership in the Marina. Here is another case study: bus service in the Sylmar, Sunland and La Crescenta areas. Even though there is considerable demand for shorter bus rides in this area, Metro’s current bus service puts a lot of resources into very long routes — some going all the way to downtown L.A. By contrast, Metro has found that only one percent of all trips — by car or transit — are headed from those areas to downtown L.A. More circulator-type bus service for short trips and better, more frequent connections to the Red Line in NoHo may better serve the market. Finally, one other point that has received some discussion: how much money is Metro willing to spend on NextGen? The general idea is to use existing resources more wisely by making the bus system more competitive and efficient. By attracting more rides, Metro thinks it can increase revenues to be reinvested in the system. Likewise, by improving system efficiency, Metro can provide the same amount of service at a lower cost or provide more service at the same cost, depending on how you look at it. The gist of it: Metro staff believes the bus system can be improved without significantly expanding its cost. Your thoughts on how NextGen is shaping up? Comment please!